Do you want to lose weight, get fit, put on muscle or just sculpt your body the way you like it? The best way to do it is with a weight system or home gym such as the Weider 2980 x Weight System. The Weider 2980 allows you to stack up to 214 pounds of resistance. It allows you to perform most of the basic exercises, doesn’t take up too much space and is easy to set up. Who Can Buy/Benefit this Product? 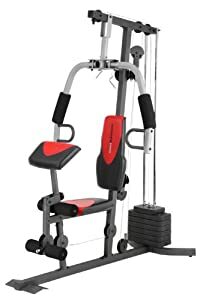 This is great for those who want to tone up and are looking for a reasonably inexpensive machine that will let them do most of the basic exercises. The Weider 2980 home gym looks nice and won’t take up a lot of space. It needs to be assembled at home which may take about four or more hours. It’s not difficult to do and comes with a step by step manual. The 2980 comes with an exercise chart so you can put together your own workout. The Weider 2980 x Weight System comes with a high pulley and a lat bar low pulley. It’s a simple machine to use and great for most workouts. Customers say that the Weider 2980 is pretty good for most basic exercises and it looks great in their home. It’s cheaper than many other models but does require self assembly. The Weider 2980 x Weight System is relatively cheap and will let you get a good workout with a range of upper and lower body exercises. It’s compact and looks quite good. This machine doesn’t have all the bells and whistles of more expensive versions and you will need to assemble it yourself. If you want to lift some heavy weights you may need something larger as the 2980 tops out at 214 pounds. If you’re looking for an effective way to tone up and strengthen your muscles then try the Weider 2980 x Weight System.